It’s likely that you’ve heard the term “HIIT” at some point within the fitness world. This stands for High Intensity Interval Training and is a type of workout based on something called the Tabata Protocol. This type of training was coined by Izumi Tabata many years ago. It’s a highly effective method for exercising and recent technological developments make it easier than ever to complete HIIT on your treadmill. When a body begins anaerobic training (also known as VO2 Max), it will enter a period of higher fat burn over a longer time span. This fat burn will last longer than it would if you had done a steady state cardio workout such as a long, slow cardio session. Best of all, the fat burn after a HIIT workout lasts long after you’ve finished your exercise so you can enjoy fat burn hours later while you’re relaxing. These short, high intensity workouts burn fat quicker than long, steady state sessions. They are effective ways to burn annoying abdominal fat and finally break through weight loss plateaus. In a nutshell, you get better results with shorter workouts! With every tabata workout, you should start with a 5 minute warm-up and then 8 minutes of exercise split into 20-second intervals. Modern interpretations of this include high intensity intervals where you are going at your maximum exertion for 30 seconds followed by lower intensity exercise for 30 seconds. The entire workout may last for 20-30 minutes. This type of workout can easily be done on your treadmill for effective fat burn right at home. Start with a slow jog for 3-4 minutes to warm-up. 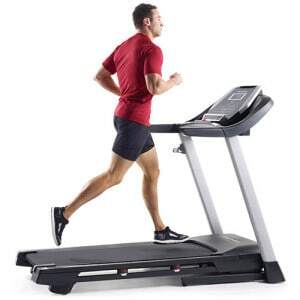 Next, increase the speed or incline for your first 30-second interval. 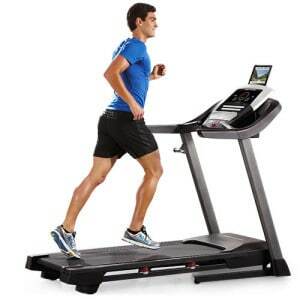 Once you’ve finished the interval, slow back down or lower the incline for the next 30-seconds. Keep your body guessing for each interval. Make some faster or some with a higher incline to challenge yourself. Once you’ve done this for 20-30 minutes, do a 2-3 minute cool down and stretching. 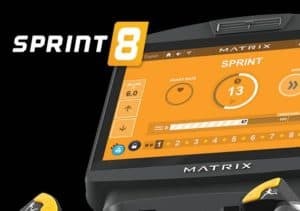 Sprint 8 is pre-programmed into your machines so you don’t need to check a stopwatch or adjust the speed / incline mid-run. This particular interval set was developed by Dr. Phil Campbell and is scientifically proven to deliver results. Mix things up even more by incorporating non-treadmill activities into your interval series. Throw in a round of jumping jacks or jump squats on the flat ground beside your machine before you hop back on to continue running. Not only will this keep you interested in the workout, but it will also make your body constantly adapt to new exercises for better results. Burn fat and calories while also providing an effective workout for your heart. Are you over the age of 40 years? Learn how to get rid of stubborn belly fat!